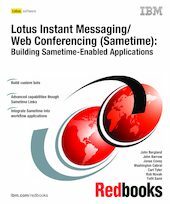 This IBM Redbooks publication builds upon two existing Redbooks: Working with Sametime Client Toolkits, SG24-6666 and Working with the Sametime Community Server Toolkit, SG24-6667. Focusing on the latest toolkits available for IBM Lotus Instant Messaging and Lotus Web Conferencing (Sametime) 3, it explores Sametime as a development platform, illustrating how to extend the functionality of Sametime beyond its more commonly known instant messaging and e-meeting hosting features. It provides a detailed technical discussion and examples for building and integrating Sametime real-time collaborative capabilities, presence awareness, and Web conferencing capabilities into both new and existing applications. In-depth discussions and code examples are provided for topics such as building custom bots, leveraging Sametime functionality through Web Services, and integrating Sametime into workflow applications. Additionally, this book reveals how you can customize (brand) your organization’s Sametime Meeting Center to more closely match the company’s identity. Finally, thorough analysis is given to the topics of Sametime Links and the Sametime Places architecture. Several samples of Sametime applications, with source code, are included. Ultimately, we hope this book will help you better appreciate how your organization may benefit by more effectively leveraging Sametime.